Want to use video to help more people know, like, and trust you? Wondering how to create episodic video content that keeps people watching? To explore how and why we produce a weekly video documentary, I pull back the curtain on our show, The Journey. In this episode, I share my experiences leading up to and then creating The Journey. You’ll discover how sharing the struggles of entrepreneurship has helped my team and business. I’ll share tips for creating your own show. 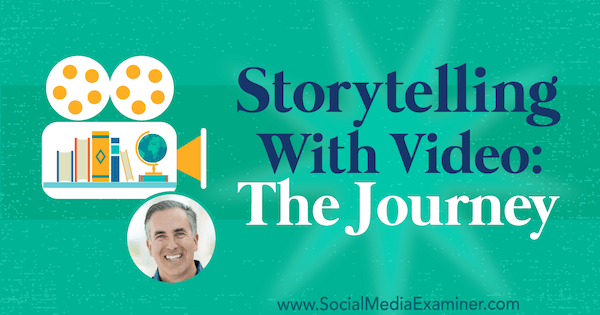 Storytelling With Video: The Journey featuring insights from Michael Stelzner on the Social Media Marketing Podcast. When I was around 10 or 12 years old, I remember sitting on my neighbor’s huge front porch and telling stories to the neighborhood kids. I’d make up crazy, fantastic 20- to 30-minute stories on the fly that involved all of my friends’ parents and siblings. I guess I knew early on that storytelling would become important for me later in life. A proverb says, “Tell me the facts, and I’ll learn. Tell me the truth, and I’ll believe. Tell me a story, and it will live in my heart forever.” The story I’m sharing in this podcast involves facing fear, facing giants, and going on an incredible journey. About a year ago, we did these NPR-style stories on our podcast and hired Jay Acunzo to do the series. The 5- to 7-minute stories came from Social Media Marketing World attendees and employees at our company, and were very well-produced. From the audio files and some B-roll footage, we then created videos and posted them on social. People absolutely loved the video versions of these stories. There was something magical about showing what was behind the story. Have you wondered what it takes to make a conference party an exceptional experience? Up to that point, with the exception of our live video show, everything Social Media Examiner did was focused on the written word and produced audio content. The emotional response after we turned the audio stories into videos planted a seed inside my brain that would later germinate. I thought maybe we could do something more regularly with video. I had watched Gary Vaynerchuk (DailyVee) crush it with video. Around the same time, my daughter, who was turning 13, wanted to get into YouTube. It freaked me out, so I decided to see what it’s like to create video content. I had this journey of 30 days of live vlogging, calling it an experiment. Because I didn’t have time for produced video, I went live every day via my iPhone on a selfie stick so I could learn what having a daily vlog was like. I made it to day 25 and quit because I didn’t have anything more to say. I felt like I had successfully accomplished something: going 25 days straight, creating on-the-fly content. It was a great experience to be my true self. Prior to this, everything I did was thoroughly scripted, figured out, and well-produced. For instance, on this podcast I generally interview a guest; I don’t just talk. The idea of winging it and seeing what happened scared me. But I believed in myself and realized what an interesting experience it was. Listen to the show to learn more about the tales I told as a kid. Fast-forward to fall 2017. I hired Mitch Dong to our team. With Social Media Marketing World coming up in February, I wanted to do something interesting and completely out of the ordinary to help us. So I talked to my core team at Social Media Examiner about creating a video documentary, which would be a real ongoing story. My goal was to show the good and the bad, the struggles of entrepreneurship and marketing. The story would unfold as we were filming. We didn’t have a script. We would document the real ups and downs of what we were trying to accomplish with growing the conference 62% year over year. I said to my team, “Are you sure? Are you ready to be authentically you on camera?” They all were up for it, so I told Mitch to bring in his equipment. We started recording in September 2017, and on October 13, 2017, we launched episode one of The Journey. That was the imperfect first episode. I was at Derral Eves’ VidSummit, and Joel Comm and I were video-Skyping with Mitch doing last-minute edits until about 11 PM. The show dropped that Friday. Listen to the show to hear my thoughts on the tension between envisioning future success and actually finishing a task or project. The Journey is an ongoing video documentary. Because it’s episodic, it has a story arc that spans lots of short videos. Each episode is about 5 to 7 (no longer than 8) minutes. The hypothesis was if we create a show about how we promote Social Media Marketing World, the behind-the-scenes type of storytelling would be the most important thing we’ve done in the company. In hindsight, this proved true. As of this recording, we have 12 episodes in the can and the results are beyond my wildest imagination. My gut instinct is that the world is moving toward video as Facebook Watch and other platforms go after creators. I felt if I could create something for our tribe so they could get to know me (the flip-flops and t-shirt CEO of Social Media Examiner) and our company, they might want to be part of the 5,000 Social Media Marketing World attendees, which is the target number of attendees for the conference. I took a lot of my inspiration from watching reality television. I am a Survivor fan; I’ve watched 35 seasons, have had lunch with the co-executive producer for the first eight seasons, and have gotten some insight into how they do what they do. I used to watch shows like Undercover Boss, and am a huge fan of Shark Tank and The Profit. I watched how these shows work and why they have such a loyal following, and I started to connect the dots. I thought, “Wow. There’s a really big appetite for business content that’s entertaining and educational. And I wonder if I can just split it up over many, many different weeks and create a shorter kind of a show.” That was the theory. I received these kinds of messages over and over. I got messages from high-profile video experts, like Zach King, telling me that they love the show; people who put on events saying the show was going to be required watching for everyone on their team; and college professors from all over the world saying the show was going to be part of their curriculum. I was hoping for that affirmation. 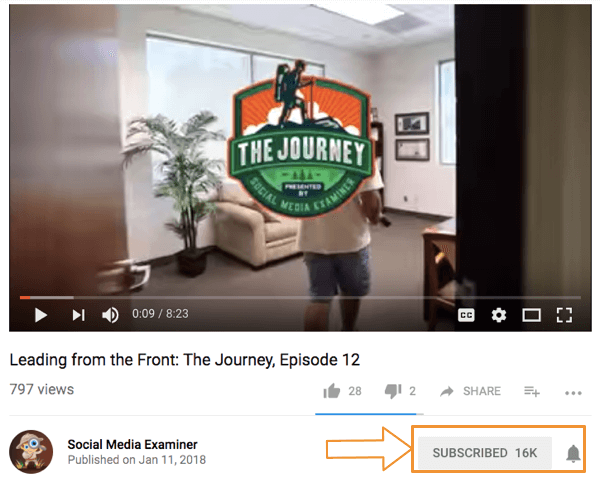 I thought if I could get 1,000 people to watch The Journey every week, we would be successful in the long run. As of this recording, we’ve released 11 episodes and between 15,000 and 37,000 people have watched the episodes. I get messages from people who binge-watch the whole series. With an average of 7 or 8 minutes per episode, that’s about an hour and a half. Outside of the podcast experience, nowhere else in the marketing world do people spend that kind of time with you. Think about ways to create more behind-the-scenes content for your business. It can be as simple as going live on Stories for 10 or 15 seconds or something more elaborate, along the lines of what we’re doing at Social Media Examiner. Listen to the show to find out why The Journey doesn’t work as audio-only. Plus, even though The Journey has a marketing undertone, people are sharing this content. Think about it. What other form of marketing are people willing to share that’s not a crazy image or funny 30- or 60-second video, but actually 7 or 8 minutes long? And it’s content that could lead someone to get hooked on all the rest of our content. Every episode has a hook to bring people into the other episodes. The show also makes us publicly accountable for the work we’re trying to do. We typically record the show about 3 to 4 weeks before it’s released, so we’ll watch and see where we’re at. The show puts us on our A game because we know the world is watching. Daniel Abrahams of Ai-media.tv (a closed-captioning company in Australia) sent me a message with the closed-captioning of the first five episodes of The Journey. They were exceptional. I said I wanted to hire him to do the rest, but Daniel said having his company do all the closed-captioning for The Journey was his gift, because he’s been following Social Media Examiner for years. The next example is Kenneth Todd, an Australian who lives in America and works for the GAIA Media Group. Kenneth sent me a video where he recorded feedback on how we could change our sales page. I implemented his changes and sales started increasing. These two examples represent the many people who reached out and wanted to help after seeing The Journey. Listen to find out how we plan to feature some of the other feedback and help in response to The Journey. Our main platforms for The Journey are Facebook and YouTube. We have the largest following on Facebook, but we push everyone over to YouTube at the end of every episode because YouTube is a much easier vehicle for watching episodic content. YouTube is our secondary platform. We have fewer views but a very loyal following. We’ve recently started uploading the episodes of The Journey to my personal LinkedIn profile via LinkedIn native video. When video comes to pages, that approach might change. As far as challenges are concerned, creating a show is a lot of work, partially because I’m a perfectionist. I care about quality and a good story. The most time-consuming part isn’t recording and documenting; it’s going through every episode with Mitch and tightening it up. Typically, he’ll put together a 20-minute episode with a lot of the highlights. Then we review the video using Vimeo because it allows you to comment and tag moments. We do at least two, sometimes three or more, rounds of edits. After we have a version that’s between 9 and 11 minutes, Mitch and I work together for 2 or 3 hours on fine-tuning that version by taking out anything that’s not important. For instance, we’ll take a long sentence and cut it into two short segments to get to its core. We don’t cover up our edits, which means we just cut and go from place to place. A lot of times, we don’t have multiple cameras, so you can see the cuts. This approach pushes the production process forward really fast. Mitch probably spends 25 to 30 hours a week working on each episode of the show. Therefore, you might need a full-time person if you choose to do video at this level. Another challenge is that you will be publicly criticized. You need to be okay with that. Some people don’t like the show. You’ll get thumbs-down on YouTube. Others just don’t like certain things about what you say and do. The benefits, however, far outweigh the criticism. The other challenge is that you and your team need to feel really comfortable on camera. And you need to protect everyone’s best interests. I call it “protecting the innocent.” We go through some exceptionally intense times. In one of the episodes, one of my employees fires a contractor. We had to be very careful about protecting the person who was fired, not telling anybody who they are. It’s important to protect the innocent because they didn’t ask to be on the show. When you do record people, let them know. Ask, “Are you okay with what we recorded? Is there anything that you want to make sure doesn’t appear in the show?” Every week, we do showings with the core team so they get a chance to see everything and make sure they’re comfortable with the way they’re portrayed. A lot of people don’t do that. I do and encourage my teammates to do so, too. They’ve got to be comfortable with themselves and how they’re portrayed, but it’s also important that you show the struggle. In the best stories, like Star Wars, The Hobbit, or Lord of the Rings, you have an unlikely hero on an impossible journey. The pitfalls and struggles along the way are actually the best part of the story. If you take that out, people won’t like the story as much. I get really raw and talk about how I’m going through hell in some of these episodes, and people love to hear that. Listen to discover what people say in response to the way I portray my journey. If, like me, you don’t have a professional cameraman around all the time, buy some equipment so you can record audio and video of yourself. By adding a high-quality audio recorder to your setup, you can record video on your iPhone or computer without running into audio problems. To record the picture you want, you might have to set your phone or computer far away, which makes the audio sound echo-y. I suggest a Zoom H4N Pro audio recorder. It’s about $200 and sounds like professional audio. Stick it right in the middle of the scene. We might hide the audio recorder with a little plant or cup so you can’t see it in the video. Second, if you use a smartphone like I do (I record on my iPhone 6S), check whether you can film in 4K resolution. We film everything in 4K so we can zoom in and create cool effects. Then the final show is produced at 1080p. You also might want to consider getting a tripod, such as a tiny one that can extend. Then you can put it on a desk or place it around the room, set the scene, and hit record. When my camera guy isn’t around, I record different angles on computers using ScreenFlow for Mac. My iPhone on a tripod captures one angle. A Logitech Pro on a computer captures another. Then a standard computer camera captures a third angle. Sometimes, I also use ScreenFlow to record my screen, because I bring in people on Skype. My camera guy can then cut among all of the angles to create a cool look and feel. Hooks, cliffhangers, and story arcs are the secret sauce for turning the content you record into a show. First, create a hook (I credit Derral Eves for teaching me this). A hook is a clip from the last third of the video. Ideally, it’s a dramatic moment that’s 3 or 4 seconds long. Play that hook at the beginning of the episode, like we did in this episode, before you roll into your typical music and intro. Doing this pulls the trigger in people’s brains that something juicy is coming, so they’ll watch the video longer. The other thing is a cliffhanger. At the end of every show, we grab something from the next week’s show. Typically, it’s something crazy like my social team just freaked out because … and then cut. In one episode, Lisa Jenkins from my editorial team said, “Oh, this has been the worst day of my life. I am so, so sorry, Mike.” And then it says, “To be continued.” We do that in every single episode. You also need story arcs, and if you’re creating an ongoing documentary, it’s important to track the core stories. Certain kinds of stories don’t come back throughout the season or are like little satellites that are there and gone in one episode, such as a little experience, a funny clip, or whatever. However, the core story arcs (we have eight or nine) spread across many different episodes. Your story arcs can include new characters. In our case, those characters are the experts we bring on. For example, we hired Chris Dayley to do conversion rate optimization. In later episodes, we bring him back and talk about the testing and what we’re learning. Another story arc features Tim Paige, whom we hired to do webinars. In one episode, we talk about setting up the webinars, and in a later episode, we talk about how well those worked. Make sure you don’t forget those stories. Any good movie or story has characters, themes, and struggles that come and go. That’s what you want to work into your show. When you watch The Journey, you can see how each element of the show improves and how we learned as we went along. In the first episode, we didn’t film in 4K. We did in the second. In the first and second episodes, we didn’t have the music tracks down and then we figured it out. Then we started figuring out the hooks, the teasers, and the cliffhangers, and introduced crazy things at the end of every video to encourage people to share it. I don’t know whether we’ll continue making The Journey forever. The episodes will appear through March 2018 because we want to take people right up to the conference. Whether we hit the goal of 5,000 attendees, we want to show people the experience, and that is The Journey. Listen to the show to hear my challenge to anyone who wants to create their own show. Selfissimo is a cool mobile app from Google that snaps photos automatically like a photo booth. Set up your mobile device, tap a button in the app so it starts taking photos with the front-facing camera. The app can sense movement. Every time you stop moving and pose in front of the camera, it takes a picture. 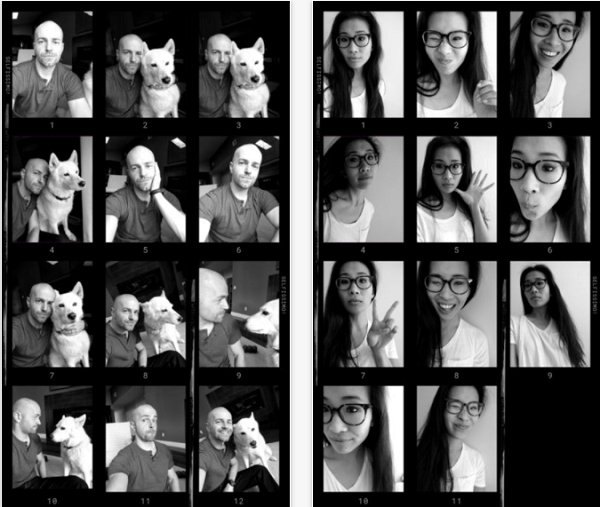 After you take a bunch of photos, Selfissimo assembles them into a grid. Selfissimo, available for iOS and Android, works like a photo booth for selfies. At a party or event, you could use this app so people can take photo-booth-style images or take group shots by setting up a tablet somewhere in the room. As soon as you and a bunch of your friends stop moving, the app snaps a photo. Then everybody moves again and strikes a different pose. Do it over and over to get multiple group shots. Selfissimo is a free app for iOS and Android. Listen to the show to learn more and let us know how Selfissimo works for you. Follow Social Media Examiner on Facebook. Learn more about Jay Acunzo and watch one of his NPR-style videos. Take a look at my live vlogging experiment. Start with the first episode of The Journey. Check out Survivor, Undercover Boss, Shark Tank, and The Profit. Learn more about Ai-media.tv and GAIA Media Group. Explore Vimeo, Zoom H4N Pro audio recorder, and ScreenFlow for Mac. Find out more about Gary Vaynerchuk’s YouTube channel, Derral Eves’ VidSummit, Joel Comm, Zach King, Chris Dayley, and Tim Paige. Check out Selfissimo for iOS and Android. What do you think? What are your thoughts on telling stories with video? Please leave your comments below.